Global Travel Media » Blog Archive » Where could the weather impact Thanksgiving travel plans in the US? Where could the weather impact Thanksgiving travel plans in the US? 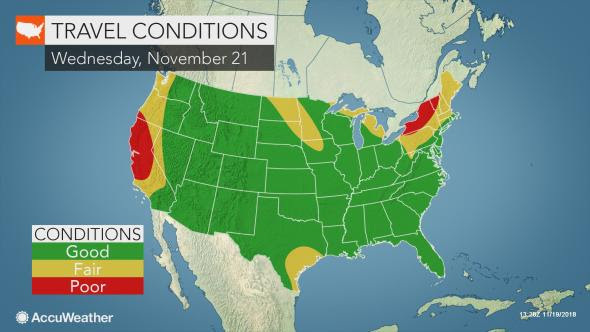 The weather will cooperate for a majority of those traveling by road or air for the Thanksgiving holiday, with some exceptions in the northeastern and western United States. The American Automobile Association (AAA) is projecting that 54.3 million will travel 50 miles or more away from home for the Thanksgiving holiday this year. Even in the absence of disruptive weather, the sheer volume of vehicles on the road in congested metro areas may cause travel time to double, triple or quadruple, according to AccuWeather Senior Meteorologist Alex Sosnowski. People traveling for the holiday can download the AccuWeather app to find out exactly when the weather could add further slow downs to their journey. The early taste of winter is expected to continue across the Northeast with batches of snow sweeping through the area and possibly lead to slick travel on occasion in the days leading up to Thanksgiving. Motorists should prepare for possibly slick and snow-covered portions of interstates 75, 81, 87, 90, 91 and 95 in the days ahead. The greatest disruptions to travel may occur Monday night into Tuesday from portions of Pennsylvania to Maine as a storm takes shape and lays a swath of accumulating snow. Travelers in southeastern Texas may contend with reduced visibility and ponding of water on the roadways as downpours cross the area at the start of the week. “There is the possibility of wet roads and perhaps minor airline delays in Houston,” Sosnowski added. Reduced visibility from wildfire smoke will be the main concern for travelers in California on Monday and Tuesday. However, a pattern change will bring needed rainfall to the state starting on Wednesday. While rain is not normally a welcome idea during busy travel times and near the holiday, any rain with a lack of strong winds would greatly favor firefighting efforts and reduce the risk of new fires igniting, according to Sosnowski. Despite the good news of rainfall, motorists will face slick roads as oil buildup from weeks of dry weather mixes with the rain.